As an avid fitness fanatic at midlife, not only am I constantly seeking out fitness opportunities for myself, I am also enjoying seeing others jump on the fitness bandwagon! If you know anything about me, you know I took up windsurfing at age 49 (slowest learning curve EVER!). Good thing I am an excellent swimmer because I do a lot of it with my board and sail patiently trailing after me as I swim back to the beach. Ever held onto a surfboard with one hand while swimming with your other arm and legs? It IS as awkward as it sounds. But I am getting better at it (and really much better at windsurfing)! By the way, a good hour of windsurfing burns up over 800 calories! On a windsurfing trip to La Ventana, Baja California a few years ago, I learned stand-up paddling (SUP). In one hour I was pretty good at it (very easy)! Within a month, I owned my own SUP board. 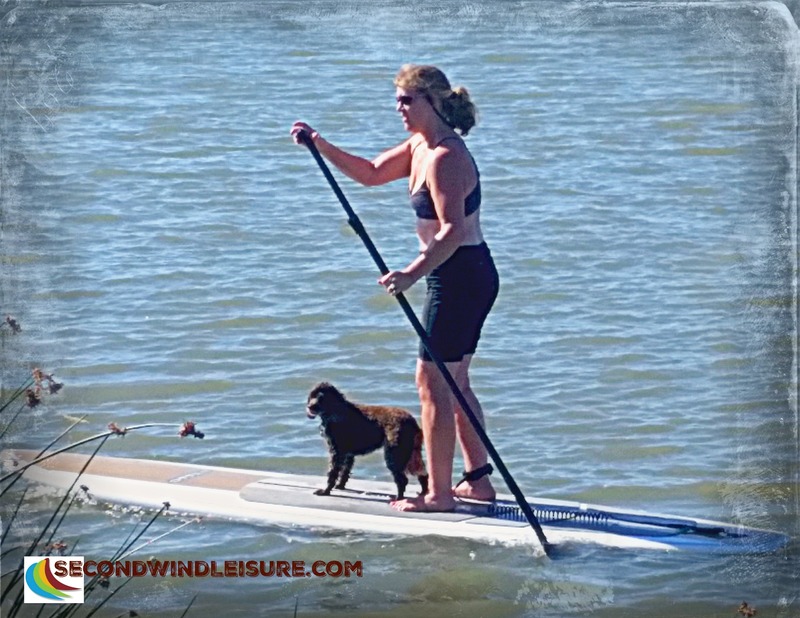 This is a great fitness experience and one can SUP anywhere there is water. I was athletic at an early age so sports and fitness came easily to me. I played on softball teams, swam competitively in high school and college, and broke some high school track and field records as a high jumper, shot putter and discus thrower (I know, weird combo). By age 18 I started running to lose weight (freshman 15), and got myself up to 5 miles a day. As an adult, I continued with more softball, continued running (competed in a couple of 5Ks & a triathlon), and experienced lots of sports injuries. In my late 40s I stopped running after I sustained a second serious hamstring pull. I joined a gym and faithfully work out 4-5 days a week! As I read some new blogs today, I discovered others on their own fitness paths: from a young mom who dropped 100 pounds from running (wow! ), another woman who is trying to eat healthier while chasing young children, and to my own cousin who just ran her first marathon wearing a dress (no less)—these stories are very inspiring! My other cousin is a world class fencer who started at age 40, and my 46-year old brother is a master’s swimmer who is ranked 25 in THE WORLD in two events. Your goals for fitness do not have to be as grand as all that! Even if you can carve out 20 minutes of walking your dog every day, you are ahead of the game (and your dog benefits, too!). 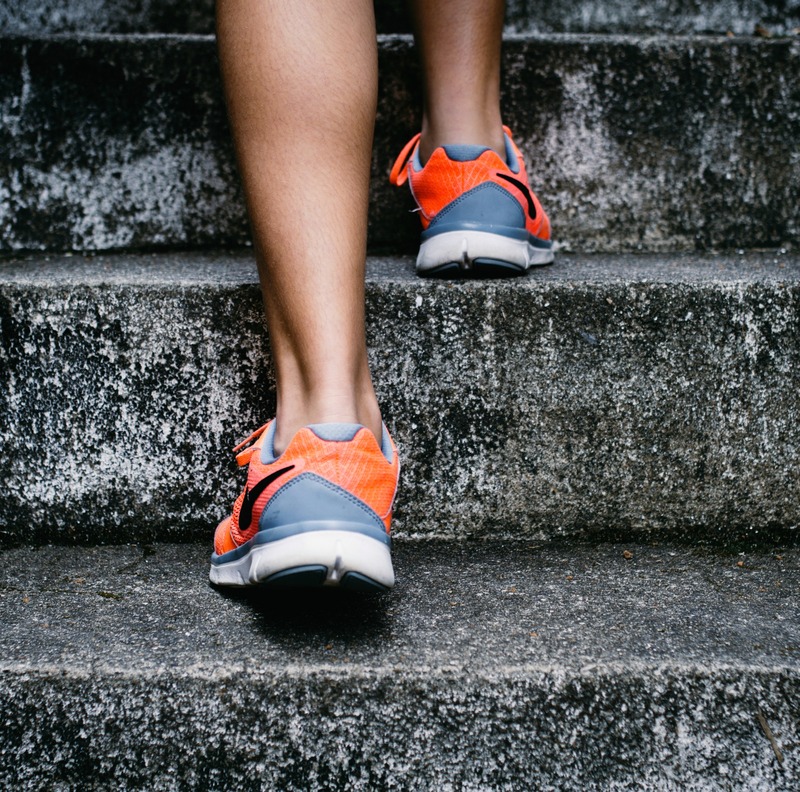 If you belong to a gym, park a little farther away than normal to get a few more steps in. I’m always amazed at how gym members drive in looking for the closest place to park nearest the front door! Fitness is where you find it. Go forth and get fit…it is easier than you think! I need to do this. It looks like so much fun. Aaahhh.. not sure about the runners high… honestly, I only go running again, because I love the park I run at and I can take the dogs and they can run off leash… I enjoy my HIIT workouts I can do at home… get more of a high from them 😉 But that is probably due to the lack of oxygen ;-)… No, I like my runs. It’s me time… and sometimes it is easier and sometimes not. Today was a good day.